In early 1942, Austrian engineer Otto Kauba had interested the RLM (Reichsluftfahrtministerium or German Ministry of Aviation) in the design of a flying bomb. The RLM founded the Škoda-Kauba Flugzeugbau in German-occupied Prague, Czechoslovakia to produce the aircraft. Kauba was assigned to work out of the Škoda Auto Works, and the aircraft were to be built by the Czech company Avia. 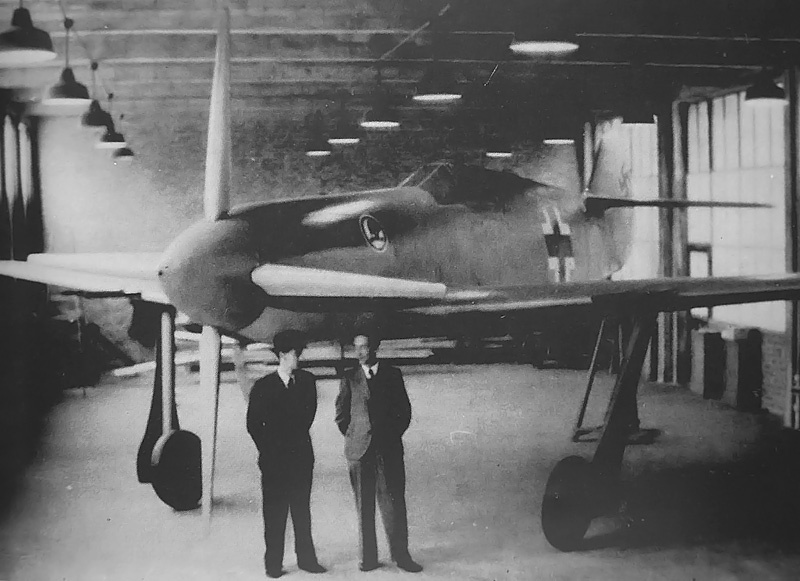 Although the flying bomb project was unsuccessful, Škoda-Kauba continued to design a series of small aircraft for the RLM, all of which were built by Avia. His next two designs yielded small and strangely shaped aircraft, but Kauba’s fourth design was a much more refined and sleek aircraft: the V4. The Argus As 10C-3-powered Škoda-Kauba V4 was a sleek and attractive aircraft. Note the cut-out in the vertical stabilizer that allowed the variable incidence horizontal stabilizer to move. 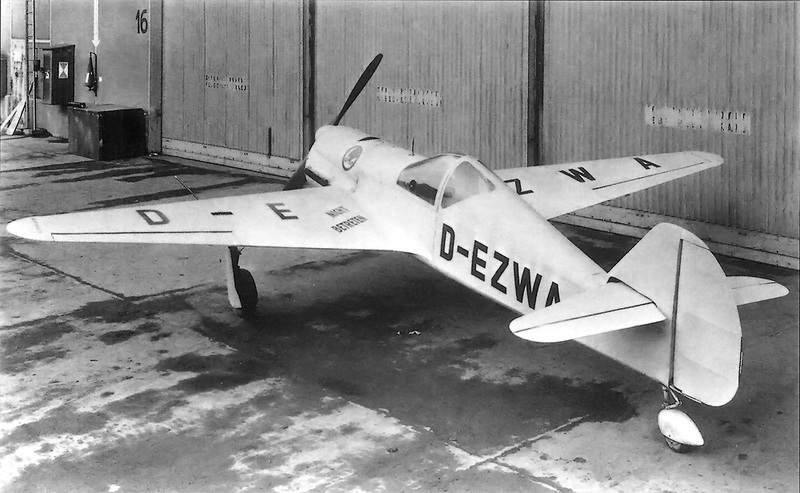 The Škoda-Kauba V4 was designed to be a single-seat advanced trainer. It was an exceptionally clean low wing aircraft with retractable, wide-track main gear. The V4 employed simple construction and used non-strategic materials, such as steel, wood, and canvas. The wing’s leading edge was swept back and its tubular main spar tapered toward the rounded wingtip. Ribs were welded onto the main spar to form the basic frame of the wing, which was then covered with plywood. The fuselage had a welded steel-tube frame skinned with plywood. The V4 had a variable incidence horizontal stabilizer that was adjusted by the pilot via an electric motor for trim control. The V4 was powered by a 240 hp (179 kW) Argus As 10C-3 inverted, air-cooled, V-8 engine. Provisions were made to mount a single 7.9 mm machine gun. The V4 had a wingspan of 24 ft 11 in (7.6 m) and a length of 18 ft 4 in (5.6 m). The aircraft’s maximum speed was 261 mph (420 km/h) at altitude and 236 mph (380 km/h) at sea level. Cruising speed was 196 mph (315 km/h). The SK 257’s initial rate of climb was 2,008 ft/min (10.2 m/sec). Its service ceiling was 24,600 ft (7,500 m), and it had a range of 578 miles (930 km). The aircraft weighed 2,249 lb (1,020 kg) empty and 2,756 lb (1,250 kg) loaded. This image gives a good view of the differences between the V4 and the SK 257 prototype. Note the different wing shape and longer Argus As 410 engine and rear fuselage of the SK 257. The V4, carrying the registration D-EZWA, exhibited good flying characteristics and performance. Since it was constructed from non-strategic materials, the RLM saw the makings of a good aircraft. However, the desire for more power could not be overlooked. The RLM awarded Škoda-Kauba a contract for the development of a more powerful advanced trainer, designated SK 257. The RLM believed the SK 257 would prepare new pilots for the challenging Messerschmitt Bf 109. Four SK 257 prototypes were ordered. The SK 257 was very similar to the V4, although slightly longer and powered by a larger engine. The SK 257’s engine was an air-cooled, inverted, V-12 Argus As 410 that produced 485 hp (362 kW). Reportedly, the SK 257 had the same 24 ft 11 in (7.6 m) wingspan as the V4, but its wing had square tips and less sweep. At 23 ft 4 in (7.1 m), the SK 257 was 5 ft (1.5 m) longer than the V4. The aircraft had a maximum speed of 217 mph (350 km/h). Two production Škoda-Kauba SK 257 come to grief. Note the different tail and canopy when compared to the prototype and the absence of gear doors. The four (some say two) SK 257 prototypes were completed and the first flew in 1943. The aircraft displayed excellent handling and performance. Subsequently, The RLM ordered 1,000 SK 257 trainers for the Luftwaffe. This order was quickly reduced to 100 aircraft. The production aircraft were built at Trenčin on the Biskupice airfield in Slovakia. The production SK 257 aircraft had a simplified square tail, whereas the prototypes had a curved tail. After five examples had been built, their construction was judged to be so poor that they did not pass the Luftwaffe quality control inspections, and the entire order was cancelled. Undeterred, Kauba designed a fighter based on the V4/SK 257 aircraft. This fighter was designated V5 and was to be powered by a 1,750 hp (1,305 kW) Daimler-Benz DB 603 liquid-cooled inverted V-12 engine. The V5 was intended to out-perform the Focke-Wulf Fw 190 with a maximum speed of 475 mph (765 km/h). It would have a 40 ft (12.2 m) wingspan with two 20 mm cannons in each wing, be 32.8 ft (10 m) long, and weigh 9,920 lb (4,500 kg). However, the V5 progressed no further than a series of wind tunnel models and a full-scale mockup. The RLM was focused on other projects and felt the development of an entirely new piston-engine fighter was a waste of time, resources, and effort. 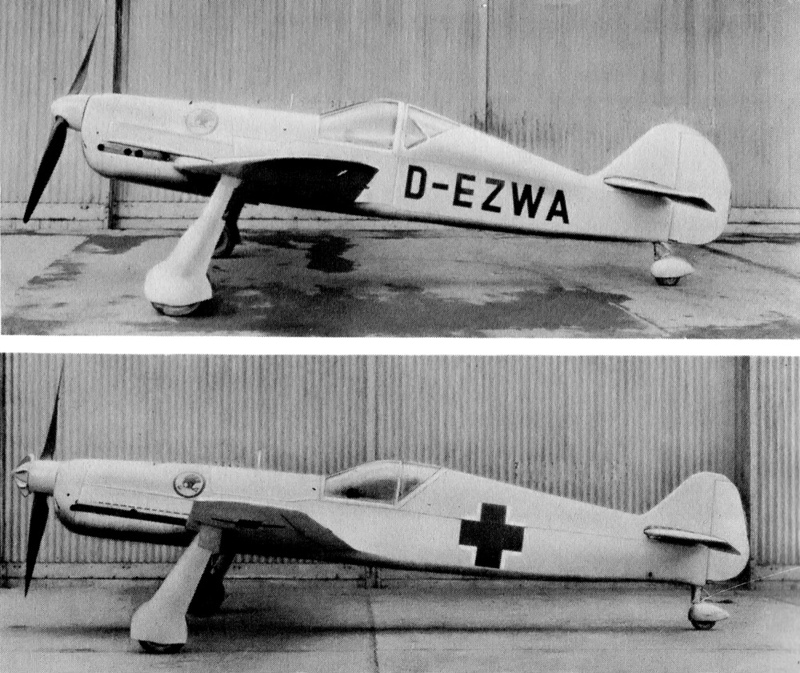 The full scale mockup of the Škoda-Kauba V5 fighter. Note the Škoda-Kauba emblem that was also worn by all the prototypes and derived from the Škoda Auto Works emblem. 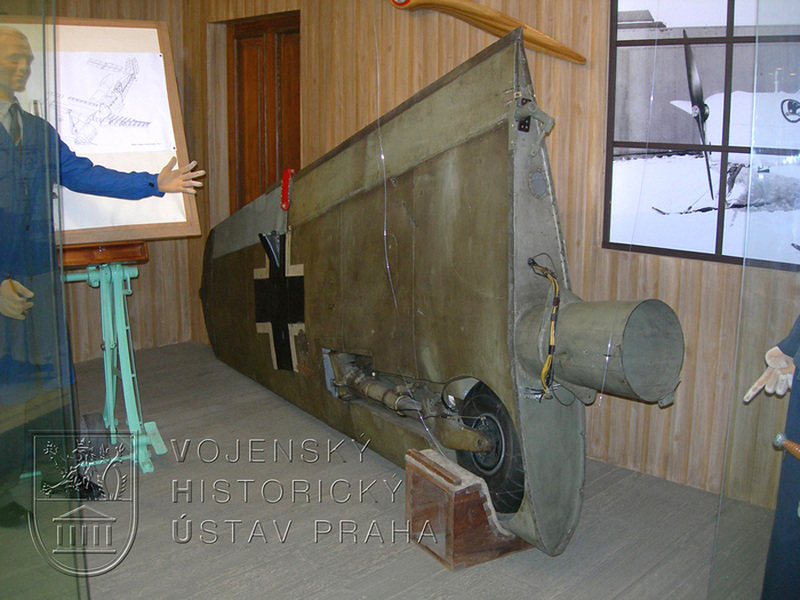 The only surviving piece of Škoda-Kauba’s efforts is the left wing, including landing gear, from a SK 257. This artifact is on display at the Vojenský Historický Ústav (Military History Institute) in Prague. This entry was posted in Aircraft, World War II on 17 February 2014 by William Pearce.